By forget guild alliances I mean I'd like each team to fight individually and not unite to gang up on certain groups etc just for the event. Please do not give out murder counts, I will try to have pets set up to flag on, but it by no means is perfect so do not be surprised if you end up with a count or two. Disrupters will be banned from the keep, I will be in voice in Lost Lands discord throughout the event. Bushwick, you continue to be an asset to community! We are fortunate. I will be there! I found a journal by Junkyard dog, I did not know he could write! So me and my dogs were deep into a catacomb when we noticed this book, after we grabbed it strange things seemed to happen. Before I knew it my dogs were attacking me! Like they were possessed. I killed them and then I ran into a mirror image of me. It was an epic battle, but I figured out I had to chop off my right hand, it was doing funny things, acting on its own, trying to kill me. If you find this, or that book, come get me. My hand crawled off with that dang book! I'm guessing what this means is we may lose some body parts trying to mess with this book, be prepared! And watch out for your friends to! If we have a large turnout we may increase team sizes, alter rules a little. Play it by ear the day of! If you're coming for sure please send me a dm so I can get an idea of numbers. 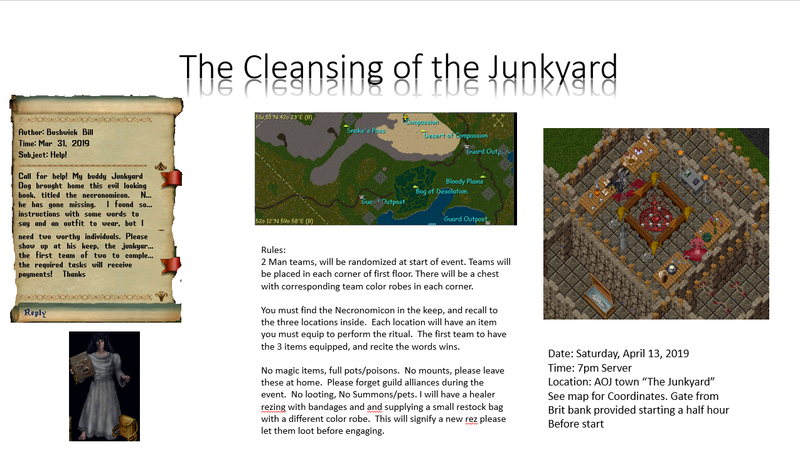 Did you cleanse the junkyard yesterday?